Blitz displays style, drive, steadiness and pinpoint accuracy to start the day. Here are some snapshots of Tim, The Forester Artist, with the girls yesterday. It was a very difficult test. Twenty-eight dogs entered, twenty-one competed, only eight qualified. 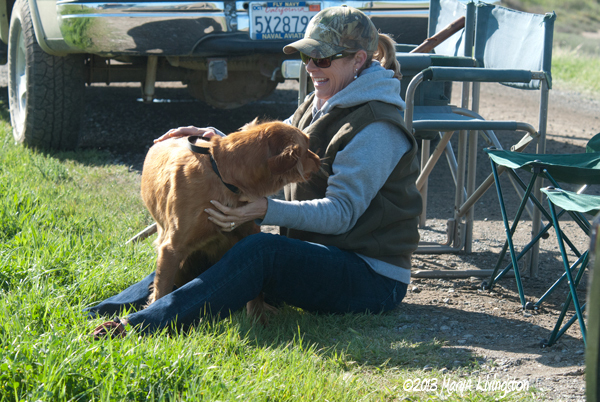 Congratulations to Blitz on her first Senior Hunter qualifier. 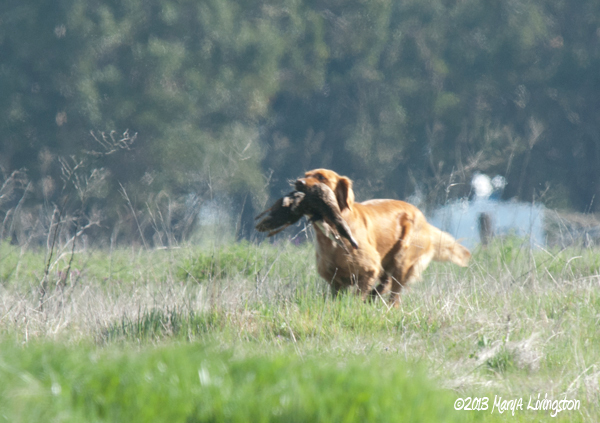 Blitz, a working golden retriever, shows nice style on her water retrieves. 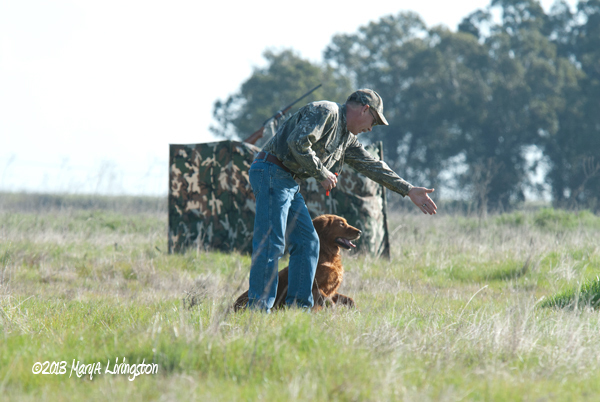 Blind retrieve: the retriever does not know where the bird is. 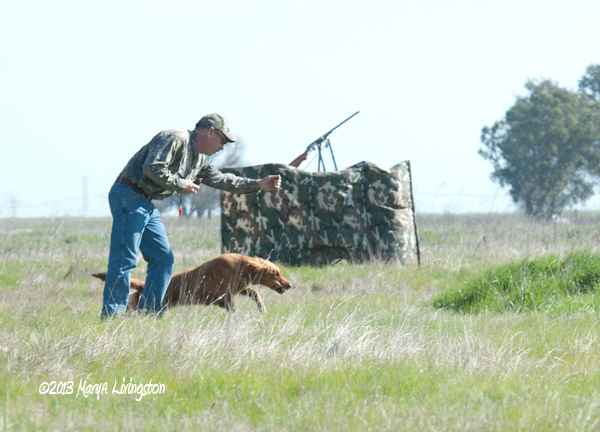 The handler must guide the retriever with whistle and voice command. 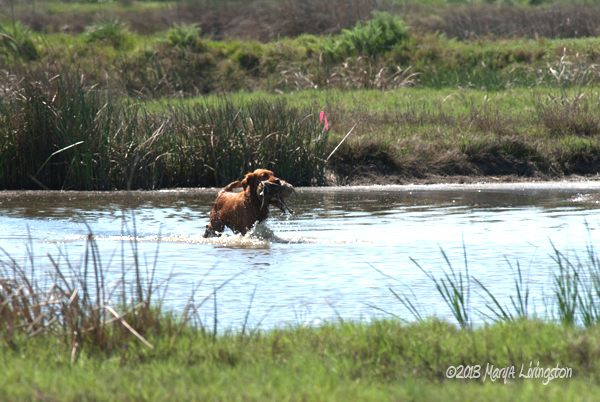 Teka shows speed and style on her blind. Teka completes her land series. 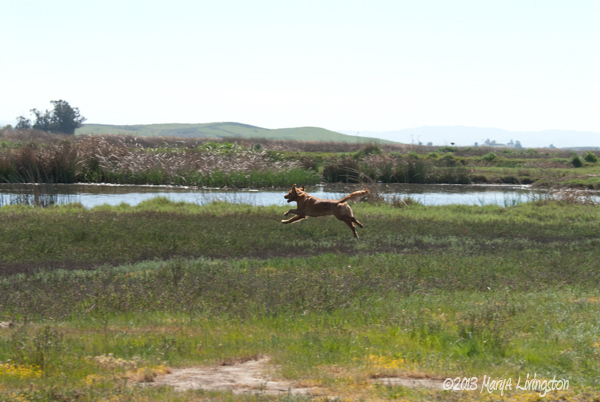 Teka is fast, that is because she spends more time in the air than most dogs. Teka on the return with her first water mark. 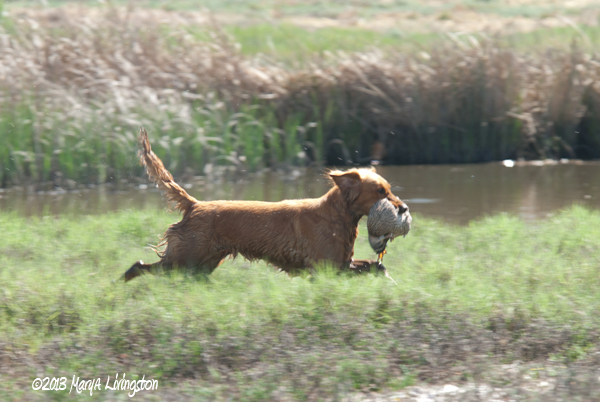 This entry was posted in Bliss Tips, Nature, Pets, Photography and tagged duck hunt, golden retriever, hunt test, retriever, upland game, waterfowl by MaryALivingston. Bookmark the permalink. Boy! That looks like fun! I just retrieve tennis balls, but I’m pretty good at it! I don’t think they give ribbons for that tho! Nice job Blitz and Teka! Someone has to keep the tennis balls in check, they can be unruly without a retriever around. Good job! Wow, that handler is a handsome guy! Congrats Blitz! Love to see the pictures of them in action! A great reminder for me, now living in a city, of just what a working dog can do! Thanks for posting this! You ought to see them at the Master level. Amazing. Congratulations! Blittz you are a great dog! Loved this post. And Tim is a wonderful trainer. But I think your dogs come from some really good stock. The pic of Tim with the girls is a nice one for sure. Blitz and Teka are cousins. They are granddaughters to my old Tessa. Teka (pronounced tek-uh)is also granddaughter to Tom. Blitz is daughter to Nellie. Now I know why your dogs are so good. ; You have managed to avoid the major problems of Golden’s except I don’t know what caused the early demise of one of yours. Thanks for the explanation of the blood line. Always remember that no matter the ancestry, sometimes things happen to individuals. Consider people, even if a woman does not have family history of breast cancer, she can still get breast cancer. We are so much more than just our genotype, the phenotype takes in “life” to go with the genes. Even though the average life of our goldens has been 13 (Nellie’s current age) sometimes bodies fail sooner or last longer. If we could account for all young deaths to linear genetics, it would make it easy as breeders. But alas, it is not that simple. Mary thanks for the reply. It is true as you have written that cancer does not have to present in the genes of humans or dogs. But `13 years is really good for any retriever, I think. I read about a study that was going to start for life history of Golden’s. I think it was University of Colorado but I could be wrong about that. I was going to email you about it since “they” were looking for dogs under two years of age. The study would follow each one until its demise but the owner’s vet had to be willing to send in or fill out a form each time the dog was seen by the veterinarian. The study is going to track just about everything including food, meds, vet visits, lifestyle even info about the dogs humans. The ultimate goal of the study was to determine as much info as possible to learn what things might be responsible for cancer and I think some other diseases. The vet profs said the study would also benefit humans as well since the findings likely can be applied to humans as well. I think they wanted 3,000 dogs in the study and had thus far as of about a month ago had enrolled about 1,000. If you are curious about the study maybe a google search could produce some info. I hate that I lost the article. I had not clipped in from the newspaper and I thought that I had it in a safe place but apparently not. It can’t be cooked out of food either, so your choice of dog food matters, especially if it contains grains that are not properly sourced. Know where the food source originates and how it is stored. Some animals succumb to this toxin by eating moldy nuts that are on the ground. In high doses it will kill within hours. In low doses cancer and other organ damage can follow. Yes I know about the aflatoxins.Can kill any animal and humans as well if you happen to ingest some or eat the stuff. I have no idea what kind of dog food to use except Royal canin which I can not afford. Too many dogs to feed currently feeding Authority which is Petsmart brand and mix most of the time with Purina One. All of it is dry except for smaller dogs and I add warm water and a bit of canned cat food. Smaller and older dogs are finicky eaters. Mary if you are busy/tired/ or sick of my questions do not feel compelled to answer me. I do not and will not mind. don’t worry about answering my replies and/or questions. Good conversation. Our performance dogs a 30/20 blend, rice and chicken base. No wheat. I don’t mind corn if I know where it was grown. As our dogs age we shift to a homemade diet. The older ones digest the homemade diet much easier. Again the ingredients are key. The current homemade mix is venison, venison bone meal (pressure cooked), rice, potato, egg, fish oil, multivitamin and pro-biotics. We measure and balance out the protein, carbs, and fats to the individual dog. We are gradually moving to mostly homemade as less processed is healthier. It is actually economical, but very time consuming. I have seen some pretty unbalanced home recipes. Sometime I will have to blog about the food. Thank you so much Mary. But you did not say what brand you buy for the dogs. Also, please let me know how you obtained your recipe or is this one you made yourself? If so you are brilliant. I think that is why your dogs live to a good age and have, if I understand correctly, lived to 13 years on average. At any rate so that you do not have to repeat yourself because I know that you are a busy bee, maybe you could soon do a post with the recipe. I don’t have venison anymore. My husband hunted deer, Our son hunts but uses a bow so he did not get one this year but his lease was not really deer friendly. The highway that I take to Austin is littered with dead deer in the late summer and fall. But they are seen along the highway in the winter also. More deer are west and southwest of us, But also plenty in east Texas. My son has never hunted in east Texas though. Thanks for patiently answering my questions. Much appreciated. Wow, it’s so amazing to see golden retrievers do what they were bred to do. My goldie can’t even retrieve a ball, but she’s very very cute so i’ll forgive her. Blitz and Teka are beyond beautiful. Brings tears to my eyes just looking at them. You must be very proud. Congratulations to you all!! Must be tears of joy. They love having a job. Living their purpose is such bliss! So that’s what I’m supposed to be doing. From one golden retriever to another, congratulations on the great work, Blitz. Hugs to you, too, Teka. And thanks to The Daily Golden for reblogging this. Signed, Miss Harper Lee, a family dog extraordinaire, as you said (I like that!). They sure look happy doing what really comes naturally to them – super pictures . Thanks for stopping by. They do indeed have the instinct. 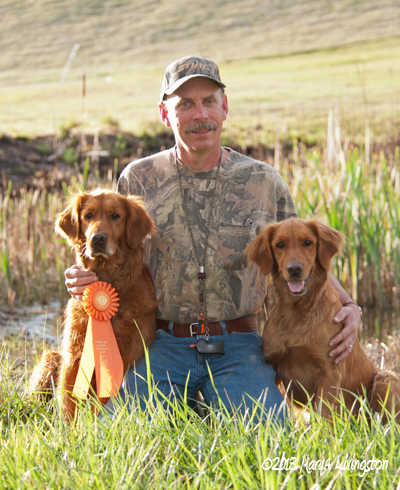 Part of training a working retriever is teaching them that they don’t retrieve all birds. We have chickens/chookies and our dogs pretty much leave them be. When a new dog comes around without the training, they will give chase. So when new dogs or guests are here, we keep chookies in their large enclosure. Mary wrote this post after the hunt test a week ago. I think it complements my latest post. We have another event this weekend. Wow – CONGRATULATIONS!!! Thanks a million for sharing. So beautifully done! What a treasure. I in fact envy the dogs living their bliss. Look so, so happy.